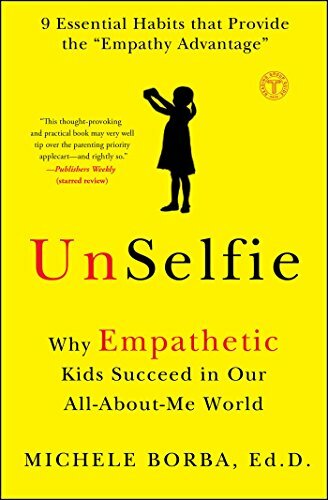 In the last few weeks before school started, I was reading the book UnSelfie: Why Empathetic Kids Succeed in Our All-About-Me World by Michele Borba, Ed.D. It certainly is an eye-opening book: as a parent, a teacher, and as a citizen in 2017. Especially when it seems a lot of the news these days politically seems to scream of a lack of empathy on one side or the other. As I was reading this book (which I finished in approximately two days given how engaging and readable it was), I thought often of my own two, personal driving forces, the foundation of Green Team Gazette: environmentalism and technology. I also thought a lot about my own children... as well as my own parenting style. In multiple places in the book, the "selfie" side brought about by social media (and the narcissistic tendencies that have been on the rise over the past several decades), the solution points to unplugging. Getting outside. Getting dirty. Building emotional intelligence through actual interaction with others (not texting). Connecting. My daughter showed me a spoofy YouTube not long ago comparing life in 2017 versus either 1997 or 1987. It really doesn't matter much for the parts that stuck in my head: the cell phones, the texting versus the hours I spent talking on the phone as a kid, the time running around outdoors not tied to a computer, meeting people in the world versus online dating. Yes, as they say: the times, they have changed. Building our empathy skills--that is the key. The secret to flipping our selfie society. Between our "plugged in" culture (kids spend approximately 7 hours and 38 minutes plugged in these days!?! Yikes!) and the "hurry, scurry, aren't we over-busy" mentality--not to mention the social media selfies, we are indeed in need of un-selfie-ing! The opposite: building empathy. Borba's UnSelfie does a great job of giving you both a lot of strategies both for yourself and your kids. It also gives you a lot of food for thought. It's leaving me pondering all of the above for days...thinking of the ways I can unplug myself, my kids, and help build all of our empathy skills!